Santiago, Chile: Nice vibe, nice people, nice wine. 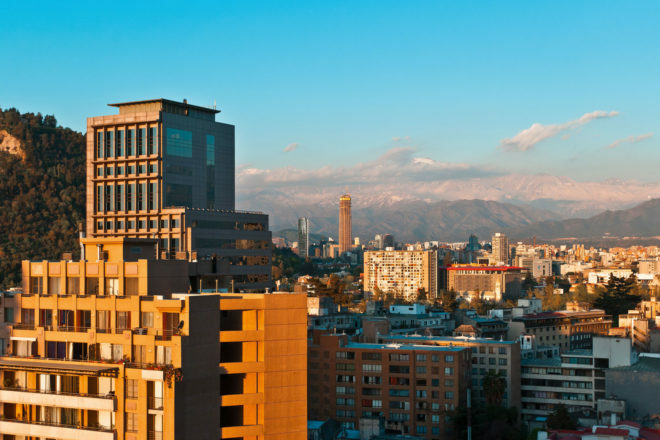 Chile’s capital Santiago blew away International Traveller reader (and travel agent) Timothy Bond. Chile: where the land ends. QANTAS began flying the Santiago route three times a week last year on the Boeing 747/400. It has a newly refurbished configuration, products and services that are also offered on the A380s. And let me tell you the airplane surgeons have done a great job with this nip n’ tuck! Those lucky enough to travel in business class can luxuriate atop the fully-flat Skybed all served up with Neil Perry’s tasty morsels. Premium economy is just as swish with super-comfy chairs designed by Marc Newson and more titbits than you can throw a stick at. Travelling in economy doesn’t mean being left out in the comfort stakes though, with a custom designed seat featuring a funky footrest net. Regardless of where you sit, the entertainment all pops up on a bigger than usual TV screen with over 1000 selections to choose from. Now that’s what I call a thirteen-and-a-half-hour flight distraction! We land in the magnificently mountainous city of St James (Santiago) at 10:00am the same day. It has a population of over six million people, but please add an eager planeload of people to that. The airport, Arturo Merino Benitez, is approximately 30 minutes from the city, and during that drive to our hotel, we saw contrasting areas: some dry and desolate areas with shanties, other lush and green condo-clad spots. All beautiful in their own right. We arrive at the opulent W Hotel and are promptly checked in and sent to our room. And ay caramba, they sure do put the W in Wow! Actually I think I stole that from my hotel room compendium. I was given a ‘cool corner room’ which was pretty much that; an ultra-funkily decorated and designed room with a deep bathtub right in the middle of the room with THE comfiest and softest bed I have ever had the pleasure of laying my weary jetlagged bones on. And because it was also the corner room of each floor, I was spoilt rotten with not just one special outside view, but two. Plus my room had the grooviest toy: a kaleidoscope! So, I’m still finding it hard to believe that I’m here in Chile, the home of the dramatic Andes, and Puerto Williams (the southernmost city in the world), some of the finest wines in the world and the birthplace of Cueca – a traditional dance which has a story of a man pursuing a woman who plays coy hiding behind her handkerchief. How cute! The ‘Santiaguinos’ and ‘Santiaguinas’ love, laugh and live life to the full and are so very welcoming. Speaking of welcoming, after our brekky the next day, we met the sales manager of the W Hotel who not only took us on tour of his deliciously appointed five-star hotel, but gave many tips and tricks for a hot time in Chile (okay, pun intended!). One of his tips was to jump on the ‘hop on and off’ double-decker bus. So we did just that. What a great way to see the city and its many different areas and people. Shopping centres, old forts, bohemian suburbs, markets and the vibrant downtown are all accessible through this bus route. If you’re up for a feed and a dance head to the Bellavista area – don’t forget to take your handkerchief! Mingle with other gringos (foreigners) and locals and try the native drink Pisco Sour (made from sugar, crushed lemons and Pisco spirit). Or sample one of the countless food options, such as cheesy empanadas, yummy hot dogs covered in avocado and sour cream, or chips topped with steak, eggs and melted cheese. If there’s ever a competition to combine every delicious food into one meal, trust me, the Chileans will win hands down! Bellavista is also at the foot of a mountain where you can catch a cable car up and see the statue of the Virgin Mary, the lesser known cousin (or should I say mother) of Rio De Janeiro’s ‘Christ the Redeemer’ statue. The views of the giant city at the top can be simply spectacular. Next to check off the list was the Elixir of the Gods… Chilean wine. We decided to take a day tour and sure enough, we found out what all the fuss is about. After an early morning departure, we headed down Route 68 towards grape heaven. On the way, we stopped off at a beautiful seaside town called Valparaíso where the locals have built their multi-storey homes into the hill. With so many contrasting designs, both old as the hill (oh no, another bad pun) and cutting edge, which is so Santiago-esque. So after a typically tasty seafood lunch at a nearby seaside town, we arrived at the Casas del Bosque winery. Modern and trés hip, we were shown behind the scenes of one of the most successful wineries in Chile. Supplying pretty much every continent on earth, after sampling their fruity and zesty wares, we knew why. But unfortunately our time in Santiago had to draw to an end, so after saying ‘gracias por su hospitalidad’ (thank you for your hospitality) to the wonderful people at W Hotel, and the people of Santiago, we begrudgingly set sail for Oz on a flying kangaroo named QF28. From my short stay there, I’ve discovered that Santiago really is an incredibly beautiful city with extremely likeable people. It all looks so magical and being able to see the ridiculously good-looking Andes from every corner, just adds that extra va va voom!